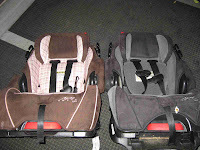 Those car seats thought they were so cool because they have plastic tabs holding their covers to their frames. They continued taunting me until I had a flash of inspiration and brought out my little bag of tricks, aka Needle Nose Pliers and his friend Wrench. Then they started crying like little baby girls. Wimps. I don't have an after picture, but let me tell you these car seats are gorgeous. After Ruthie threw up in the car on the way to jouer avec Rachel et Natalie, I knew it was time for a good cleaning. 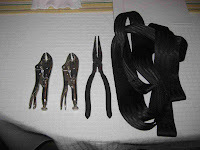 I had also ordered new straps, and wanted to install them. No joke, from start to finish, not including the time they were in the washer, it took 4 person hours to clean those suckers. They put up a good fight, but I won. And it felt good to defeat them. I'm embarrassed to say this, but we took a carseat apart once to clean up barf and I could not get it back together for the LIFE of me. My husband even has 2 degrees in mechanical engineering and the car seat won. So way to go. That is HUGE. You're a champ! and I might consult you when I do dare take it apart for a good wash too.